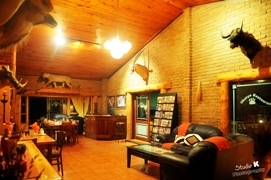 Accommodation in George: Kwelanga Lodge Private Game Reserve. 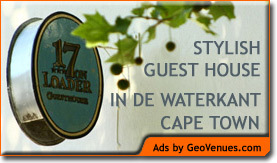 You are here: Home / Western Cape / George / Accommodation in George: Kwelanga Lodge Private Game Reserve. Kwelanga Country Retreat is situated close to the city of George, off the N2 highway. The lodge is within easy reach of George Airport, which is served by all domestic airlines with flights to/from Cape Town, Port Elizabeth, Durban, Johannesburg and Mpumalanga. This delightful haven is a home away from home, situated high above the sea on a small game farm stocked with game such as wildebeest and zebra, and with abundant birdlife. The lodge has a large open-plan lounge/bar area, together with Ove’s Restaurant, which extends out onto a large wooden deck overlooking unspoilt coastal bush and astonishing sea view, allowing for outdoor dining when the weather is fine. The lodge also has a swimming pool. Accommodation is in eight beautifully-situated log cabins, all with views over coastal bush and the sea. All are en-suite with glass sliding doors and private wooden decks. Some cabins are equipped for self-catering; they are air-conditioned and have satellite TV. Towels and linen are supplied. Units are serviced daily. 2 cabins accommodate 2 people sharing (1 double bed OR 2 x twin beds).